Happy Birthday Warner Brothers. This week, courtesy of the Daily Telegraph, I learned that this film studio is 90 years old. David Grittens’ article suggests that Warner Brothers introduced a grittier sort of realism to the cinema audience of the 1920s and 30s. For a start their actors – including Ingrid Bergman, Humphrey Bogart, James Cagney, Bette Davis – looked right for their roles, rather than being picture perfect. You know they have lived a little and will use that life experience, one way or another, as the story unfolds. Being liberal – and very tongue in cheek – with the concept of realism I would say Warner Brothers offers some personal development pointers too. Here are three thoughts on the subject. 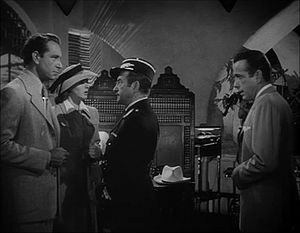 Casablanca’s Rick would love to rekindle the pre-war romance he had with Ilsa. However he adjusts what he wants in favour of what the situation (War, Fidelity, Resistance) demands. He lets her go. They will always have Paris after all. That sounds like a simple action to take, but the impact it has for all concerned is huge. Wile E Coyote will always strive to catch the Roadrunner and will always come to grief doing so. He doesn’t stop to learn wisdom from the many setbacks he experiences – with or without the help of Acme Corporation products. He probably needs a coach to support him in identifying realistic options and then to do some effective action planning. Christopher Nolan’s Dark Knight might also benefit from some support, so that Bruce Wayne can look deep underneath the Kevlar body armour and find out what he truly wants. That might make his life less conflict-prone.